I had a friend recently ask me to post a meatloaf recipe, so here it is Aaron 🙂 This recipe is based on a tried and true meatloaf recipe from Fannie Farmer. Of course there’s a twist or two though. Monkey Man and I were given ground venison from a friend. I was totally stoked and my first thought was “Meatloaf!”. In theory, it’s a great idea but there are two things to consider before getting all crazy. Venison has a gamey flavor so I’ll probably need to cut it with another ground meat. I remembered that I had some chicken defrosted in the fridge and a meat grinder attachment for my KitchenAid (seriously my best investment ever). Okay, that’s dealt with – what about the fat? Venison is super lean and so is chicken. 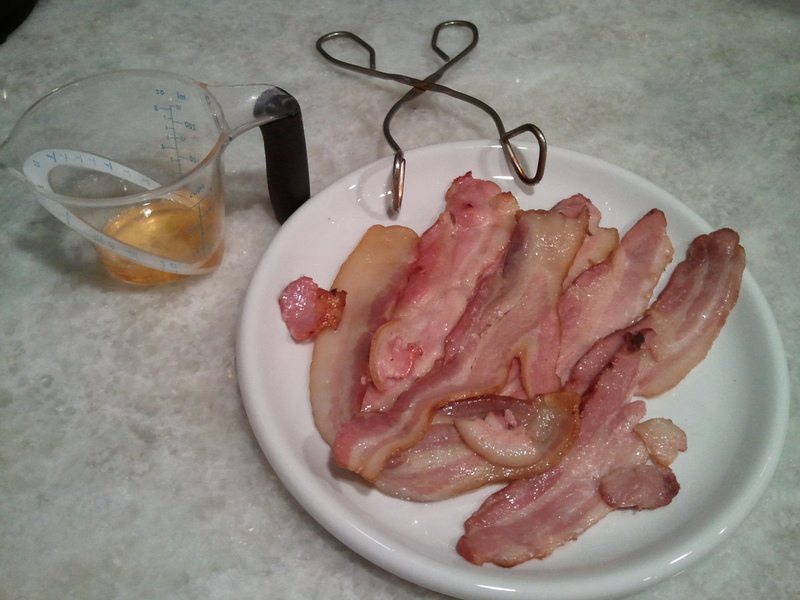 Two words – bacon fat. Done. I also like zingy foods and this recipe has Buffalo Tabasco sauce. It’s gives the meatloaf a little kick and flavor at the same time. I used the George Foreman grill because I can lay the bacon pieces out nicely so they cook evenly and I can collect the bacon fat directly from the grill trough. You can cook the bacon in a saucepan over medium heat and just pour off the bacon fat – but make sure you turn the pieces so they cook evenly. 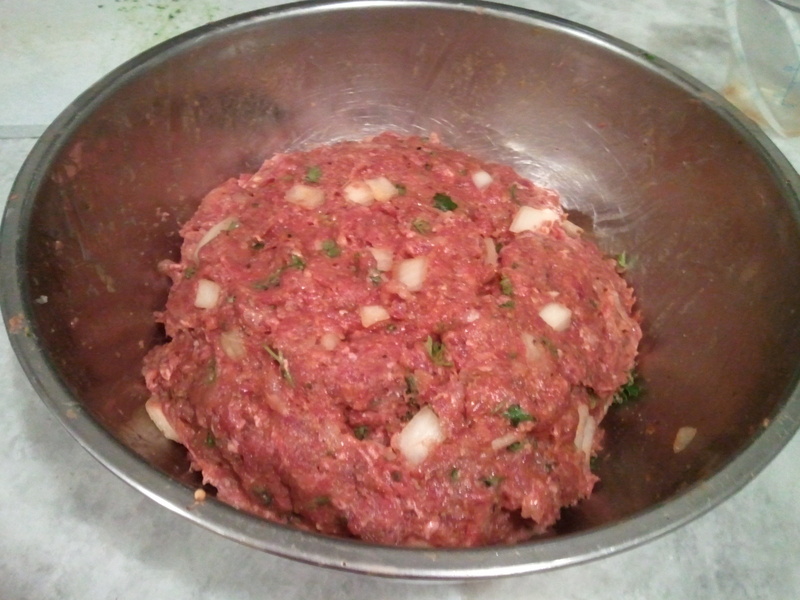 Now, combine the ground meat and almond flour in a large bowl – mix by hand. It’s messy, in a fun sort of way. 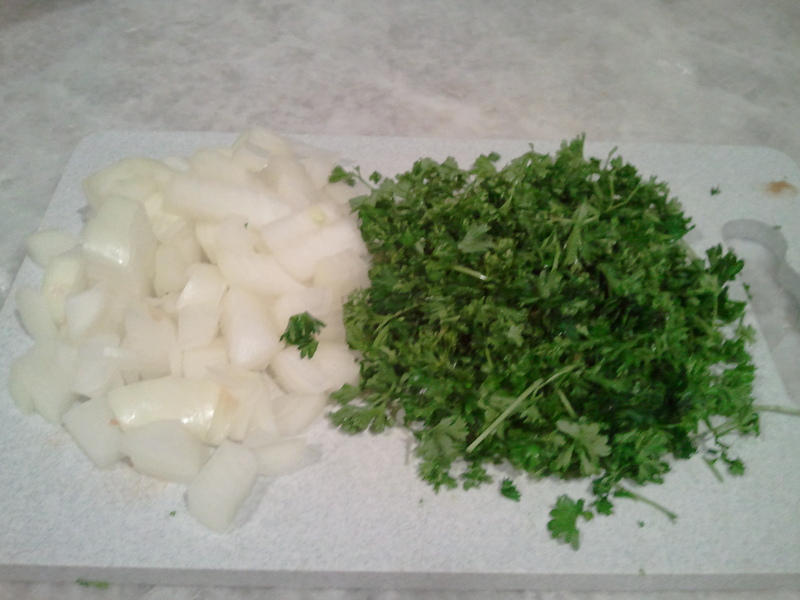 Next, add the chopped onion and parsley. Add the bacon fat and mix. Now, slightly beat two eggs. Add the Worchestershire sauce and Tabasco sauce to the eggs. Add the spices (salt, pepper and mustard) and the egg mixture to the bowl and mix thoroughly by hand. Line two baking pans or loaf pans with aluminum foil and grease lightly – I used ghee. 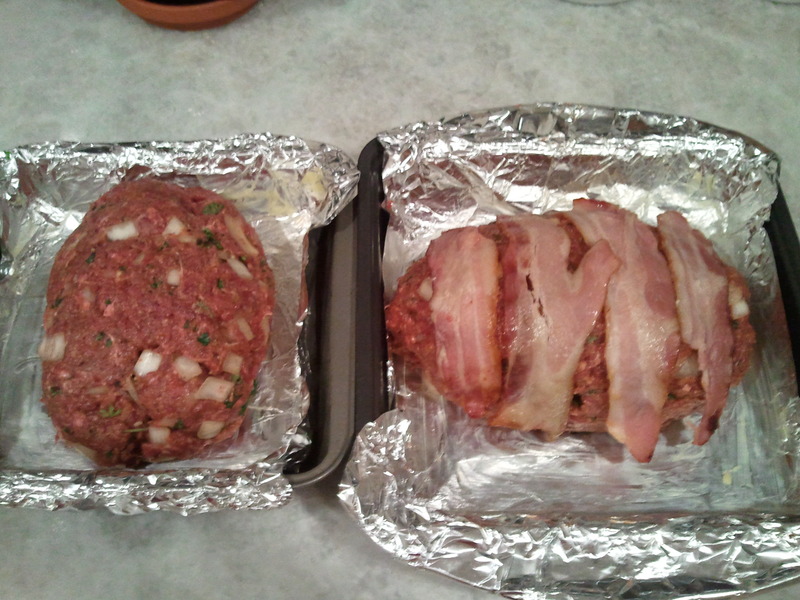 Mold the meatloaf into a loaf shape and place in your baking dish. Cover the loaves with the partially cooked bacon. Insert a meat thermometer and place in the oven to bake for approximately 45-60 minutes. My loaves took about an hour to cook so that the center had a temperature of about 160F (medium). Let the loaves sit for about 10 minutes before serving – that allows the loaves to set and hold their shape. What would I serve this with? You could go old school and serve with pureed turnips or cauliflower or a nice roasted veggie mix. But the fun’s not over yet! Serve with a bourbon ketchup by adding 1 1/2 t. bourbon and 1/2 t. molasses to 1/4 c. of ketchup. Or add 1 1/2 t. of dijon mustard and freshly chopped tarragon to 1/4 c. ketchup. Or serve with a Kansas City style barbecue sauce. Let me know how you served yours! This entry was posted in chicken, main dish, pork, venison and tagged bacon, chicken, gluten free, paleo-friendly, parsley, tabasco sauce, venison, worchesterschire sauce. Bookmark the permalink. Okay. I am seriously thinking of getting a George Foreman grill just to fry bacon on, now.